This is one of the quickest desserts I've ever made that also ended up being the biggest hit. Yes, it's fruit but it's dessert fruit! Cut through the peaches until you hit the stone all the way around, twist and separate. Pull the pit out. Brush with oil and place cut side down on the grill and leave for about 5-8 minutes until there are nice grill char marks. 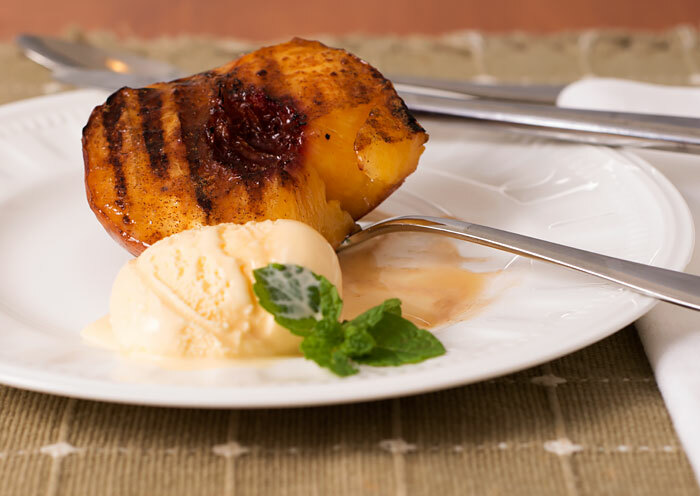 Flip the peaches over and drizzle just a bit of maple syrup on each one and sprinkle with demerara sugar and cinnamon. Cook about 5 more minutes, then plate up. Serve with whipped cream or ice cream and maybe a piece of shortbread.